Stop the NoseBleed Epidemic with NoseBudd! Over 45 million people each year suffer from Nosebleeds in the US alone! Help fight this epidemic with NoseBudd! By applying cold and pressure directly to the nose with a uniquely shaped design, NoseBudd Helps to Stop Nosebleeds COLD! Invented by a Hemophilia sufferer, Steve Riedle has known about nosebleeds all of his life and knew there had to be a better way. Epistaxis, more commonly referred to as a nosebleed or bloddy nose, can be frightening for the person who experiences it and can cause much anxiety. It is estimated that 1 in 7 people will experience a bloody nose at some point. NoseBudd works more quickly than other conventional methods and is designed to be reusable, and thus is a highly cost-effective method of treating epistaxis. 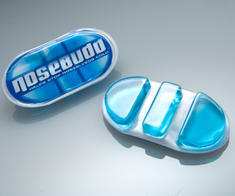 The unique design of NoseBudd allows for NoseBudd to provide cold therapy to the area where it is needed, avoiding causing numbness and cold to the face. 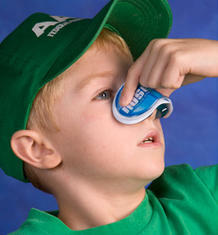 NoseBudd is generally effective at stopping a bloody nose in 5 minutes, much more quickly than traditional methods. NoseBudd Helps Stop NoseBleeds Cold! Please change your photo of the little boy using this product as he is leaning backwards, which is the entirely wrong thing to do. The head should be leaned forward so that the blood does not flow down the back of the throat, and possibly obstructing the airway.